On MSNBC's Morning Joe, just hours after the election of Donald Trump as the 45th president of the United States, the show's co-hosts and panelists sat around a table in 30 Rock's famed Studio 8H. The home of Saturday Night Live was packed with a live audience—and yet, this was a quiet room. The conversation bounced from how Trump pulled off his historic upset to how the media missed the story of the century entirely—an analysis that would go on to dominate the conversation in the days that followed. "The media was all in on this narrative," co-host Joe Scarborough told his audience. "Everybody was marching in lockstep: Clinton is going to win, Clinton is going to win." In fact, just 24 hours earlier, the chatter on Morning Joe and most other news programs was centered around Trump's narrow path to 270 electoral votes. When Donald Trump pushed back during interviews, including two Election Day call-ins to Fox News, he insisted that journalists were missing the story, that the huge crowds at his rallies were a sign his support was larger than pollsters were predicting. Those voters, MSNBC analyst Mike Barnicle admitted the day after the election, "were ignored by pollsters, they were ignored by media, and they showed up yesterday in astounding numbers." Careful polling, analyzed by network "decision desks," played into the reporting—and networks' underlying planning for coverage of the campaign and election night. But the underlying data was flawed. Worse, suggestions that Trump could outperform his polling—or perhaps that the polling simply had the story wrong—were met with, at times, hostility. Clinton was always shown as reliably in the lead. So why did the media never seriously consider a Trump upset a very real possibility? "Many news outlets never took Trump seriously as a candidate because they covered him as a circus act," says University of Georgia journalism professor Chris Shumway. "It all fit within the framework or narrative of a reality show, which was set early on." Even the press conference at which Trump announced he was running for president—the candidate and his wife Melania descending that escalator at Trump Tower—was covered by the press as somewhat of a curiosity, a sort of curveball being thrown at the real candidates—but certainly not a legitimate political story. Trump took the media's interest—in particular that of cable news—and ran with it, ignoring traditional campaigning and dominating the news cycle with rallies (carried live by cable news networks seeing a Trump effect on their ratings) and call-in interviews on shows eager to talk to a candidate who might say anything. There was little incentive to employ actual reporting, thus raining on a very entertaining parade. "It's not a conspiracy," says Shumway. "But rather, institutional and economic imperatives were guiding the train once it left the station. Political campaigns have been constructed and covered like product marketing campaigns for a long time. As news profits decline, there's more pressure to create revenue. Market values beat journalistic values." So Trump, Shumway argues, benefited from the news focus on spectacle instead of issues—which helped Trump inoculate himself against critical reporting. "He benefited from bad journalism, but also made journalists the enemy," he says. "People being attacked trying to cover a story is uncalled for and should be denounced," says CBS This Morning co-host Charlie Rose. "And I want people to continue to speak out against it." "I know journalists don't generally like to be a part of the story. None of us do," adds CNN anchor Erin Burnett. "That's not what we are all here for. There are times where journalists want to take a hard stand in regard to a story, but we don't want to become a part of the story in this way." And Washington Post media columnist Margaret Sullivan wrote Wednesday that Trump, "who called journalists scum and corrupt, alienated us so much that we couldn't see what was before our eyes. We just kept checking our favorite prognosticating sites and feeling reassured, even though everyone knows that poll results are not votes." Even Nate Silver's obsessively followed site FiveThirtyEight, which gave Hillary Clinton at one point a mere 65 percent chance of winning the White House, still had her winning. The Huffington Post, by comparison, put her odds at 98 percent. HuffPost's Ryan Grim called out Silver, saying his forecast model was "merely political punditry dressed up as sophisticated mathematical modeling." Silver shot back that Grim's argument was "idiotic and irresponsible." After the election, Grim apologized. But clearly, there was resistance to questioning the foregone conclusion that Clinton would win, and most likely win handily. Journalists tended not to question the polls, but relied on them as evidence Trump was, in fact, losing. Late Tuesday night, Trump adviser Michael Cohen tweeted: "I have only two words to say to all the pundits and liberal media who doubted Donald Trump: #SaysWho." It was a reference to something Cohen had said in an August interview with CNN anchor Brianna Keilar. When Keilar suggested Trump's campaign was down, Cohen responded: "Says who?" Keilar's response, which went viral, was blunt: "Polls." How off-key that sounds in hindsight. The question everybody has been asking since the wee hours of Wednesday morning when Trump delivered his victory speech in New York is: why? It's not as if Trump didn't urge journalists to focus on the crowds, to see them for what they were—a coalition of committed voters who would turn out not just in red states but deep blue states as well. "We have massive crowds. There's something happening," Trump said at a rally in Miami just a week before Election Day, before turning his attention to NBC News reporter Katy Tur. "Katy, you're not reporting it. But there's something happening, Katy." Newspeople quickly took umbrage at Trump singling out a reporter before a huge crowd but largely ignored his underlying message: It's the crowds and not your polls. "This is a shtick that he does—it's to rile up his base. It's to give them an excuse for polls that might not be in his favor," Tur explained to MSNBC's Brian Williams. A week later, nobody was berating Trump. The world now realizes that, indeed, there was "something happening." "Not only did the media get almost everything about this presidential election wrong, but it became the central issue, or the stand-in for all those issues, that the great new American Trump Party voted against," media observer Michael Wolff wrote in The Hollywood Reporter on Wednesday, noting viewers could literally see the surprise on news anchors' faces on election night. "Every anchor and commentator on network and cable news last night underwent a visible transformation from self-satisfied and jolly certainty to wandering in the wilderness," he noted. "In a situation that only had two possible outcomes, nobody was even able to pretend they had contemplated both." With the election a done deal, the media will begin the process of scrutinizing their faulty coverage. In his congratulatory memo to CNN staffers on Thursday, CNN Worldwide president Jeff Zucker said as much. "Books will be written, experts will opine, and hands will be wrung," he wrote. "I am a strong believer in learning from experience, and there will be ample time at CNN to think about what we learned about our reporting and our audiences, and use that information to continually make our journalism better." "Let's face it," says Fox News anchor Shepard Smith. "Donald Trump manipulated the television airwaves for a long time, and no matter what he was saying, whether it was on point or if he was selling products or talking about his hotels, we were there. We hadn't faced this sort of thing before. I think reevaluating is something that we do after every big event, whether it's elections or attacks or rioting. We will reevaluate, and my voice will be one of restraint." Given Trump's win, and a Republican Congress come January, perhaps restraint is the last thing the fourth estate should embrace. 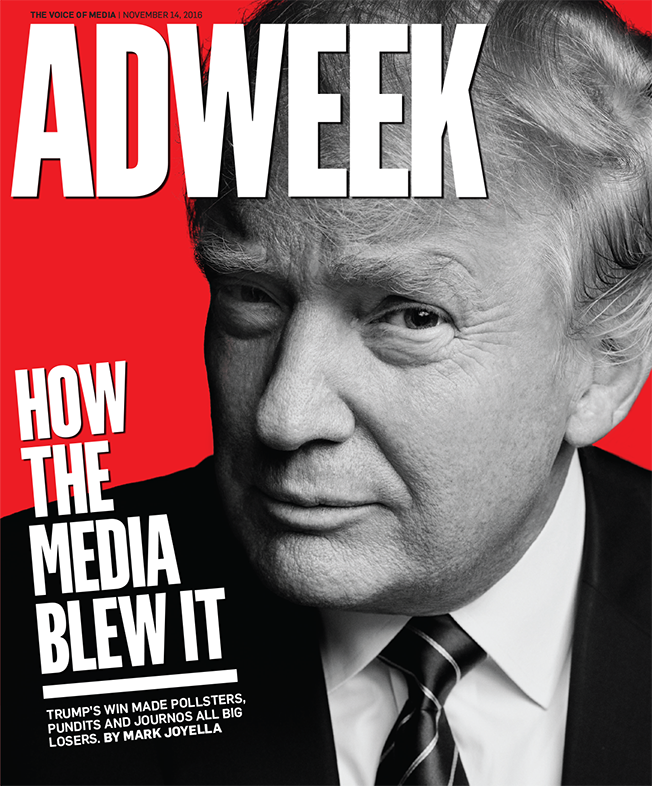 This cover story will appear in the Nov. 14, 2016 edition of Adweek.